Through the years 1454 and 1455, Louis and Charles argued back and forth, each trying to assert his own will. Eventually King Charles raised an army and was going to attack Louis in the Dauphiné. 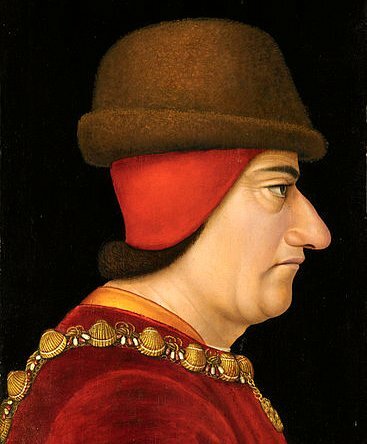 Louis fled to the court of the Philip the Good, Duke of Burgundy where he stayed until his father died in July of 1461. While he was there he had a good opportunity to investigate and analyze the personalities of Duke Philip and his son Charles, Count of Charolais. This in depth study would serve Louis well when he became King and Charles became Duke of Burgundy, the mortal enemy of Louis. Louis didn’t act like a king. He didn’t keep a magnificent court but stayed on the road with a small retinue, constantly riding on horseback. He dressed plainly, usually in hunting garb so he could leave the road and hunt when the fancy struck him. He would sup with peasants and avoid official welcomes in towns by turning off the main road on arrival. He would sometimes work, hunt and ride simultaneously. He left Queen Charlotte and her servants in the castle at Amboise and would visit her when it suited him. For the most part he was faithful to Charlotte. They would have two daughters, Anne and Joan, and then a son, Charles, born in 1470.